Here’s our new project bus “The Roach Motel.” Back in the 60’s “Roach” was my nickname so I thought I’d resurrect it for this project. 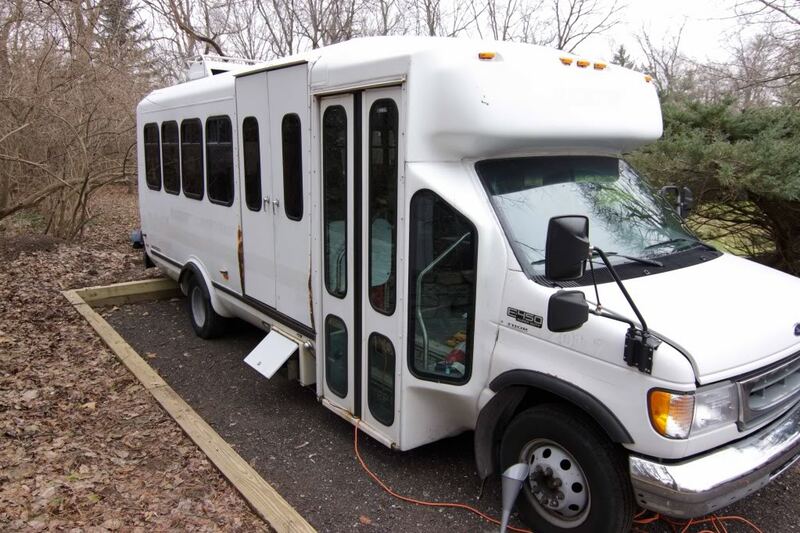 It’s a 2000 Ford E-450 chassis with a 24’ Aerotech body and a 7.3L diesel with only 92,000 miles on the clock. Plusses are working AC, 6 fairly new tires, power side door opener, a new alternator and A FULL TANK OF GAS. 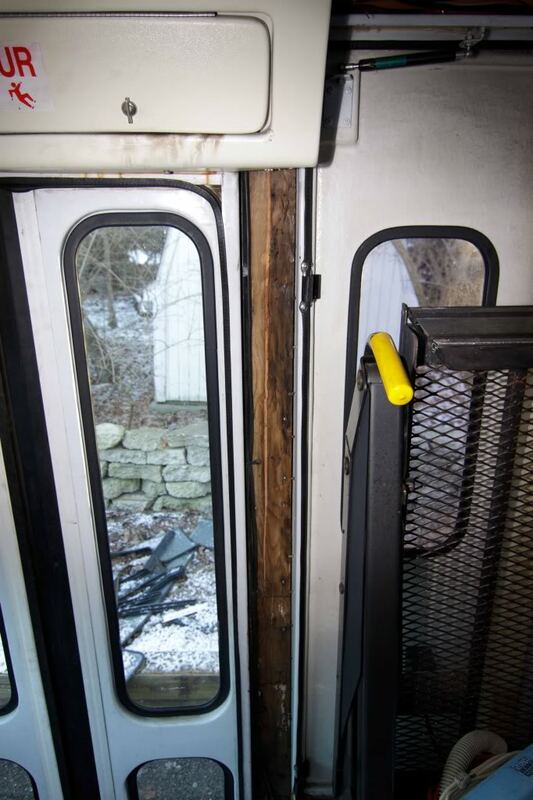 We got it at one of the online auctions from the local metro transit authority. Their busses are typically way more used up than this one and I think we got lucky even if we did have to pay up for it. The batteries were dead when we picked it up so we had to jump start the beast with two vehicles to get it started. The tires were low so we pulled it over to the bus terminal to top them off and found that one of the inner duallys was flat. The bus guy said his drivers just drive in when they have a flat rear tire so off we drove, Lorna-style (that is, no license plates and no insurance) for the 40 mile drive home. It’s true that with duallys you always carry two spares. The trip home was uneventful except that I was having trouble getting it much over 65mph. That kinda concerned me until I realized that we were driving into a 20 mile headwind. Driving something that big wasn’t a big deal. It handled like my GMC van on the highway. The trans shifted nicely but the batteries didn’t charge up on the drive home. When I parked it I shut it off then tried to start it again and the starter just clicked. Clearly, I need to have a look at the battery connections. Actually, this project has already cost us a bit because the local codes require that RV’s be parked behind the house which required us to extend our driveway a bit. Of course, while we were at it we had the rest of the drive resurfaced and that cost us pretty much what we’d budgeted for the entire bus project. The old drive was a bit of an eyesore so maybe the neighbors will cut us some slack during the conversion process. The weather is rapidly turning on me here in Michigan, but I hope to get the stripes removed to keep the HOA at bay then strip the seats and wheelchair lift and begin sealing the window frames prior to insulating the beastie. The rear AC unit will also be coming off so a shower can fit in the rear corner. After the demolition is done I’ll start in the back and work my way forward installing the bed in the left rear corner and a shower and bathroom right next to it. Add a dinette, a kitchen counter and two closets and the job’s done! A coupla weeks work, right? Lol Anyway, I hope to be far enough along for a shakedown cruise in the early spring. I’ve been on this forum for a bit over a year now and I *think* I have a good floor plan but time will tell. I’ve also picked up many bits and pieces from ebay and craigslist over the last year or so and that should make the credit card shock a little easier to handle as this project moves along. So, here we go! Damn the torpedoes’, full speed ahead! It's a "smart" bus. Needs a "smart" car to tow behind it! The stripes are gone, but not the adhesive. That's going to be a pain to remove. I did pick up one of those plastic razor blade thingys. Very handy little tool. Between that and wifey's hair dryer the tape came off more or less willingly. Where the tape was the fiberglass is nice and shiny but everywhere else is dull and oxidized. Looks like there's some rubbing and buffing in my future. Most of the seats are out too. Tonight I'm going to remove the stripper poles cause I'm tired and that job looks easy. All the battery connections are shiny now and the batteries themselves charged up nicely but still no charging when the engine's running. I put a volt meter between the alt and ground (with the engine running) and I'm just reading battery voltage. As soon as I get it insured and plated it will be off to the repair shop. I've also got a trans leak to throw money at and I still haven't looked at the brakes yet. I'm hoping those doggys have some life left in them but I KNOW in my heart of hearts, that they'll need to be replaced too. Transferring the title went very smoothly. I took receipts for my RV mattress, sink, range and porta-potti and asked the kind folks at the Michigan Secretary of State office to wave their majic wands and turn my bus into a motor home. I signed a paper that claimed that I'd converted it from passenger bus to motorhome, paid my sales tax plus $15 to transfer the title and off I went. In a few days I'll insure the thing and go back for the license plates. The bus only came with an ignition key and naturally Ford has to be difficult and have seperate keys for the doors and ignition. I pulled the door lock and took it to a locksmith who keyed the door lock to the ignition key for $20. One less key to lug around! Any suggestions regarding rubbing out fiberglass? Don't get in a hurry to toss the poles yet. You may decide to use them in another place or keep the hand rail at the steps. We still have all ours (plus the poles/hand rails from the Eagle) in my daughters shed. I think we may be putting the hand rail back up at the steps, but in front of the heater which is on the opposite side of where it was originally installed. I was thinking the same thing. I'm keeping 4 of the seats and all the poles. Not sure whether they're stainless or chromed but those tubes have got to be useful down the road. Like most schoolie types, I look at an item and try to think of alternate uses. Monday was a really nice day up here in Michigan and I got a lot done. and I only found one section of rotted wood (so far). Fortunately, it's in an easily repaired spot. I also disconnected the lines back to the rear heater. 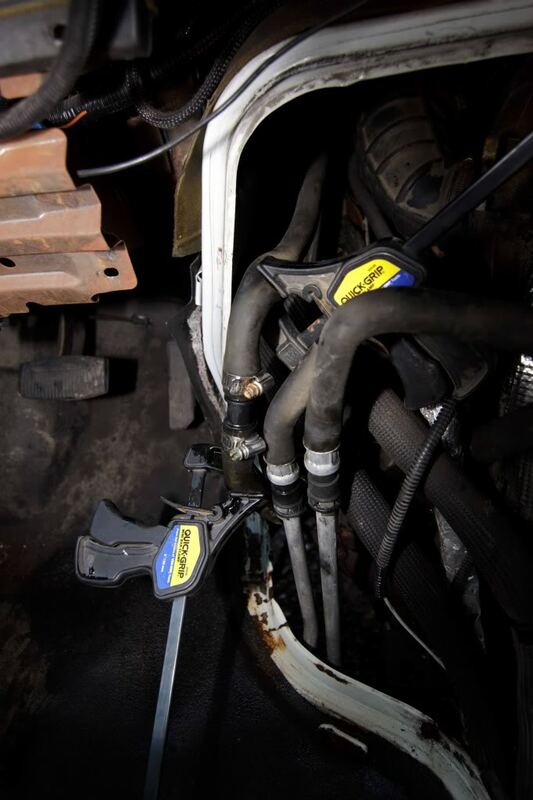 Note the clever use of woodworking clamps to avoid draining the cooling system. Anyone know what this thingy does. Looks like it's heater related. This fuse panel needs to be relocated. 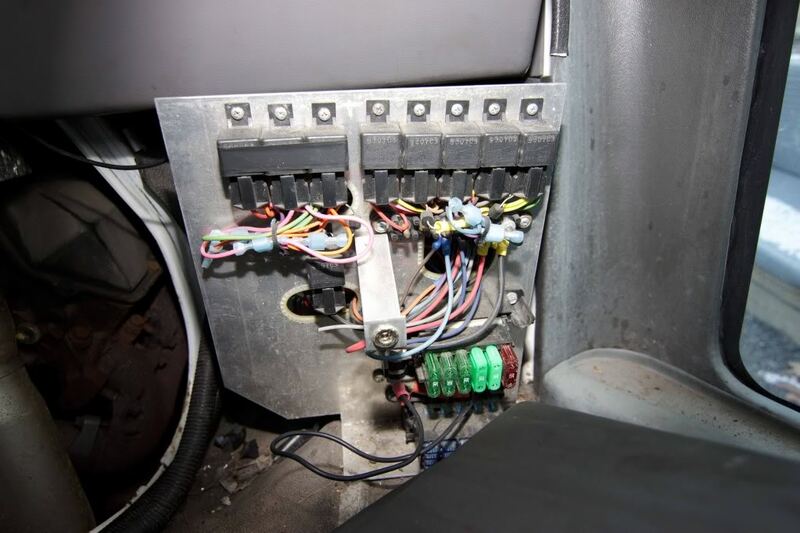 After removing all the extra wiring I'm thinking I'll try to move this panel into the area behind the air bag door in the dash if there's nothing there already. 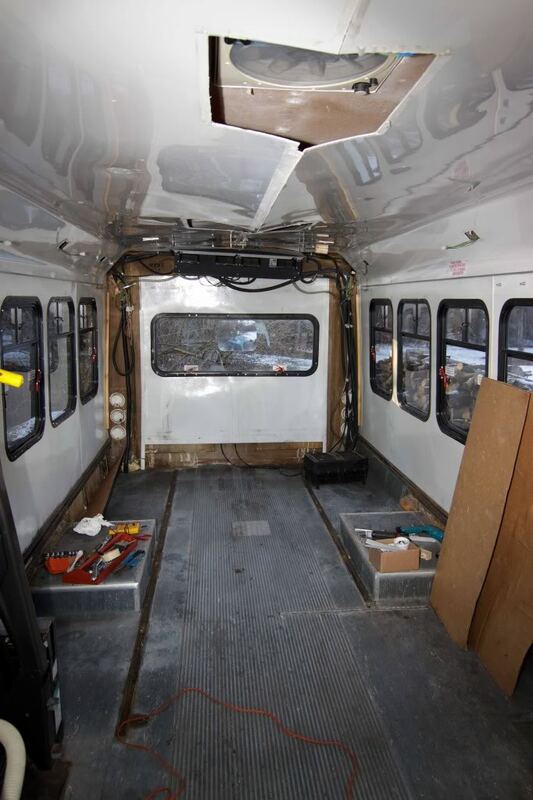 I discovered that the bus floor is one sheet of 3/4" plywood so the plan is to just insulate over the existing floor. I have 6'7" of headroom at the center aisle now so insulating the floor and ceiling with 3/4" insulation looks very doable. The plan is to insulate the walls up to the side windows leaving that whole window area uninsulated. I just can't think of any practical way to insulate around the windows. I will attach some sort of carpeting to the fiberglass between the windows to keep the chill down and dress it up some. I also ordered a key switch that I will connect up so I can open the side door from the outside. I got liability only insurance from GMAC for $216/6 months. At first I got a quote from the website then I called a service rep to actually sign up. The rep quoted me a price $35 higher than the website so I went back online and signed up there. 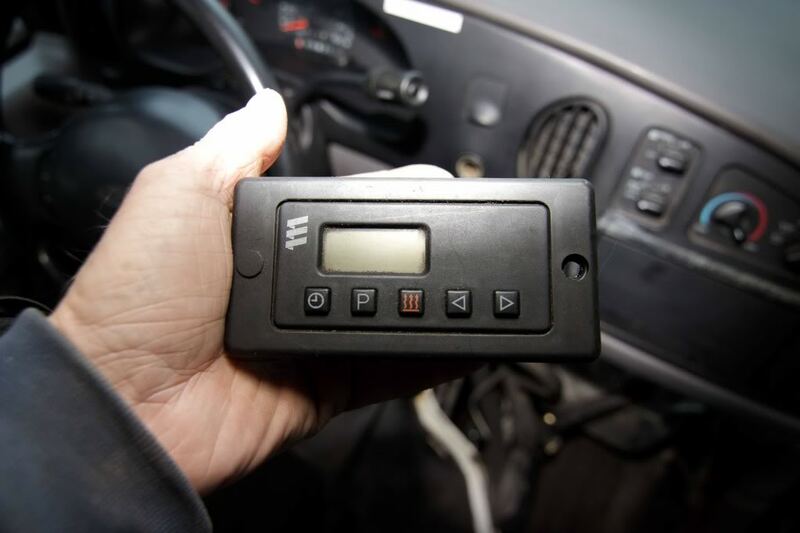 The website also mentioned a substantial discount for the time a motorhome is parked in a "secure storage lot." My back yard seems secure enough so I'll definitely look into that a bit later. There was no option to print the proof of insurance form online so I'll have to wait a bit longer before getting my license plates and terrorizing the neighborhood. Progressive wouldn't insure a Ford E-450 at all, suggesting that I check with their commercial arm instead (I....don't....think so). My Allstate rep mumbled and scratched his head and eventually admitted that he had no idea what to do with my rig. Apparently insurance folks don't handle the new experience very well. We're back to snow and cold here in the Great White North so progress will be slow. Hey Roach --- glad to hear the weather cooperated long enough to get some ripping & shredding done. Feels good, doesn't it!? And, I could be mistaken, but I think the gadget you are holding in that one pic may be an early Federation Tri-Corder. But seriously folks...any Aerotech owners out there recognize it? A tricorder would be seriously cool but a phaser would make my life a lot simpler. Want that funky A/C unit gone? Press a button and it's vaporized! I'd even settle for a used light saber. A few days ago I tried to loosen the lug nuts on the duallys so I could get that flat rear tire fixed but they wouldn't budge even when I stood on my breaker bar. Today I found a 5' pipe for leverage and with great difficulty finally got the nuts loose. At least the ratchet didn't explode. If the weather cooperates tomorrow maybe I can get the thing off and get it fixed. That pipe will be traveling with us, for sure. The weather today is rain/snow and 35 degrees. I went out for a minute to take some measurements and two hours later I had dropped the A/C unit (on my head) and pulled up most of the nasty old linoleum. This demolition thing is addictive! 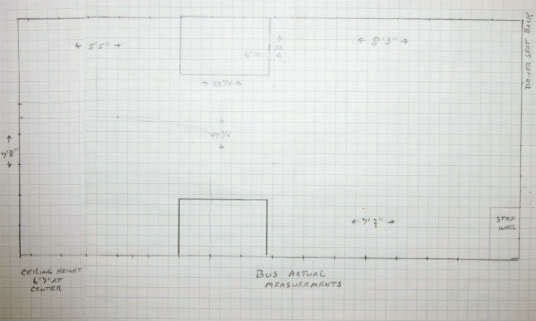 Here are the bus measurements. I was pleasantly surprised to have a few extra inches over what I planned for. Length behind the driver's seat is 16' 7" and the headroom is 6' 7" at the center aisle. Very usable space even after the insulation goes in.